Hey y'all! So I guess it's officially the end of the patriotic nail art season! 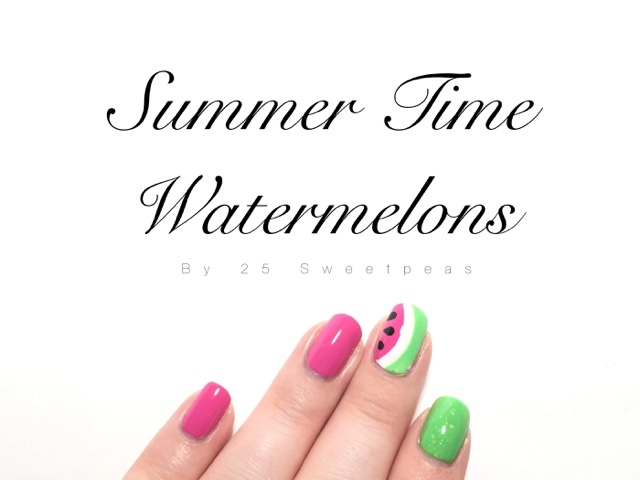 That being said last night I had some yummy watermelon and I realized I've never done watermelon nails... I then fixed that so let's check them out! This look was so easy and I just love how bright it is! :) plus it's a lot different from everything I've been doing lately! Nice change of pace. 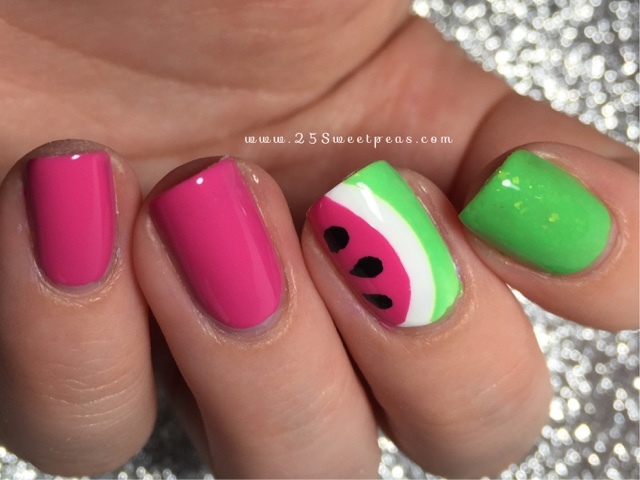 :) For the watermelon nail I started with a white base. This time I used INM White Porcelain. Then I let that dry and then applied a quick dry top coat. I used Seche Vite. Then after than was dry I used a nail vinyl by Polished Vino Vino Vinyls. I used one that would get you a French tip and put it on where I wanted my white to show. Then on one side I painted pink, and then the other side green and then removed the vinyl and had a clean white line in between the two colors. 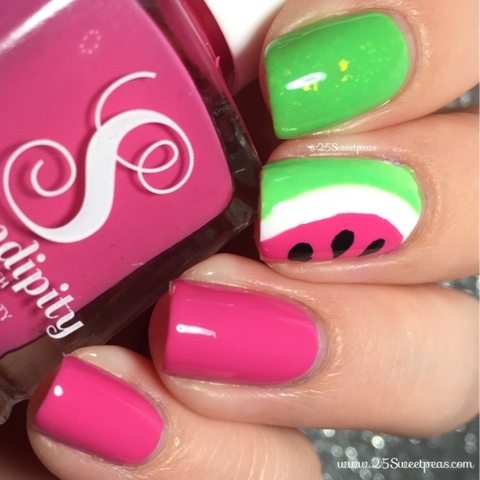 I used Serendipity Pink Poinsettia as my pink polish and Takko Lacquer El Nopal as my green. Then I free handed the black seeds with acrylic paint. Well that's it I hope y'all have enjoyed this post! It's a bit odd to being doing designs that aren't red white and blue! Haha! Oh well I will adjust quickly! So what would y'all like to see? I like the name "Serendipity" was one of my favourite movies! Don't know if you've watched it! 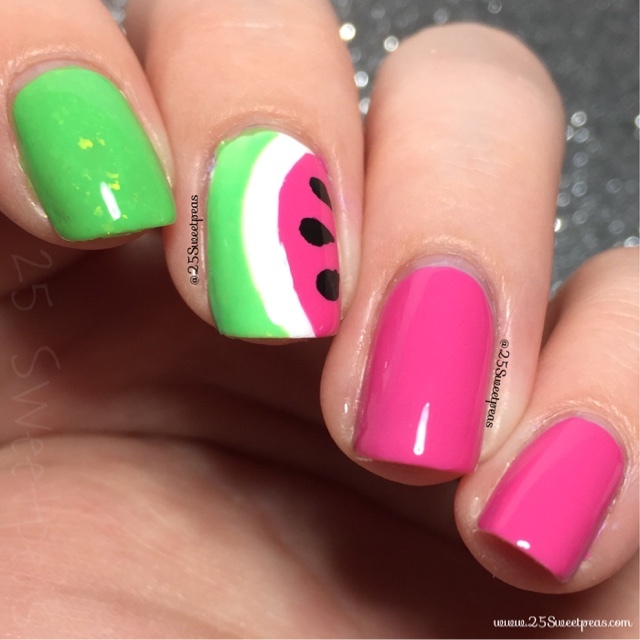 Anyway i like that you've only done one finger like that - i've also done watermelons last year, but i've done all my nails like that.